Greatest name for a store, ever! 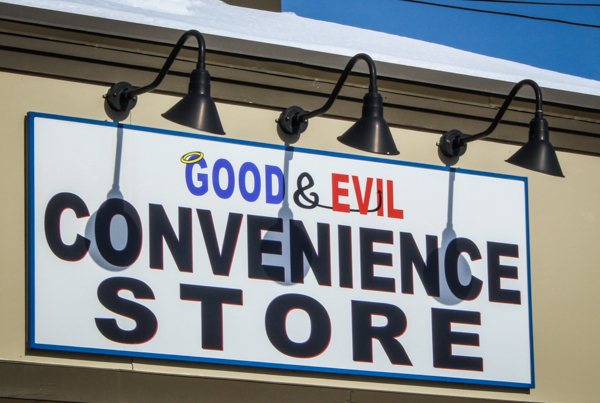 This store isn’t mentioned in this article (and service here is excellent), but I LOVE the name! All of us have cashier and store clerk horror stories and instances where “customer service” was anything but. We’ve all dealt with disinterested teen cashiers and surly seasonal clerks who chat with friends as they count our change. We’ve tolerated rude clerks and cashiers for whom social politeness is a nebulous concept. We’ve each faced people behind that counter who make it very clear they are not interested in us, or our business. Despite that, my experience has been that the customer is FAR from always being right, and that cashiers, store clerks, and anyone who works behind a counter (cashiers from this point forward for ease of reading) are often the victim in the transaction, and with that in mind, I’d like to propose the beginnings of a “Cashier’s Bill of Rights.” While hardly inclusive, I think it’s a good start. You are not better than, or superior to, a cashier. So many customers, if they even bother to speak to the cashier, talk down to them like they are stupid, or beneath them. Someone working a register at McDonalds is often a hard-working individual who’s on their feet all day, and often at their second (or sometimes third) job. Customers, if you are talking on your cell phone while you are being waited on, the cashier should have the right to say, “I’ll be with you as soon as you finish your call. Next in line, please.” You expect a cashier to give you their full attention, return the courtesy. Stop throwing money at cashiers. Stop placing a fistful of change on the counter and expecting them to count it. Put the money in their hand, like they do for you. If you have a problem with a cashier, discuss it quietly. If you’re not getting anywhere (and that does happen), then ask to speak the manager. Be firm but polite. As soon as you start yelling and making a scene, you’ve lost the argument. Keep your cool. I saw a guy in a local store a year ago who was screaming – I mean screaming – at the cashier because she would not accept the many coupons that had expired — A YEAR BEFORE. The police were called because the guy got so crazy. Look, it’s one thing to ask a cashier for an exception to the policy, and we all have special requests, but don’t be an unreasonable jerk and make ridiculous demands. Cashiers rarely make corporate policy but must enforce it. Don’t be a jerk part one: I once saw a woman at Shaws yelling at the flower clerk because he could not fill a special order quickly. She kept threatening to go to his manager. When she left, I gave the kid my name and phone number and said if the woman made trouble I would speak to the manager and stand up for him – he had done everything right, and had been nothing but polite to the crazy flower lady. It would be unfair for him to get in trouble because a customer had a bad day. Stop getting angry because the cashier asks to see your ID when you buy cigarettes or beer, even if you look like you’re 90. It’s the law, it’s their job. And it’s a good law. Don’t yell at the cashier because your credit card was declined. Take it up with your bank. Likewise, the cashier doesn’t work for your doctor or insurance company. If your coverage is declined, don’t blame the cashier. Be reasonable when arriving at any business just before closing time. It’s one thing to need an emergency prescription, or medicine or baby food or something. It’s quite another to do a massive amount of shopping or needing a lengthy transaction five minutes before closing. Years ago it was two minutes to closing at the post office and I was buying stamps. The door opens and a man comes in to mail a large box. To Nigeria. The box isn’t even sealed. He hasn’t filled out any custom forms. And it’s now 60 seconds to closing. The clerk on duty took care of him and was very polite to him, but I left thinking how unfair it is for someone to do that. Look – there are valid reasons to patronize a business minutes before closing. But unless it’s important, let cashiers close up on time so they can get home to their families. Parents, control your children. Get off the cell phone and pay attention to little Jimmy and Sally running around amok, knocking items off the shelves and causing havoc. We all love children but they are NOT precious when they are trying to climb inside a soda cooler or throwing merchandise on the floor. Foxboro teens: Local businesses are NOT your playroom to mess up and cause havoc. Period. Parents, when the store manager tells your teenager to leave the store because he/she was caught shoplifting AGAIN, please don’t yell at the manager. Please speak with your child. Sternly. On that note, it boggles my mind that many store managers are not allowed to ban repeat shoplifters because “Corporate” doesn’t allow it. Finally, a few years ago, I was the bad customer. Because my bank neglected to tell its customers that they’d lost over 10,000 records, they decided to ensure our security by confiscating ATM cards — without notice. I was one of the ten thousand. I was very abrupt with the supermarket bank cashier who told me she couldn’t help me – the ATM wasn’t even their bank (and not the one that lost all the records). But honestly, I was a jerk to her. I felt so bad leaving the store – and five minutes later, I went back and apologized to her. “I’m not THAT guy, who comes in to make YOUR life hell,” I explained sheepishly. She was so nice about it. I felt really bad – but better after I apologized. At Saint Anthony’s Church in Boston, there is a counter where people can buy mass cards and other items. A sign reads, “Christian courtesy is the rule here – on both sides of the glass.” That’s good advice! Friends, the person behind the counter often works harder than you do. They are not your servant, you are not better than them, and their time is valuable too. Perhaps if you started treating them with a little more respect and courtesy, you would see a lot more of that good customer service you’re always complaining you never see anymore. Silver-Age Superboy comic book (in)justice! → ← Boston, you’re my kind of town!